The Bolt XR is a powerful scope that will significantly improve your ability to hit distant targets. With the ability to clearly focus on targets up to 60 yards away, you will be able to clearly see your prey even if your bow is not powerful enough to shoot that far. Designed for durability and performance, this crossbow scope might be just what you need on your next hunting trip. Some consumers have mentioned that they wished the reticle was illuminated for easy viewing at night, and while this might be convenient it should be noted that it is not always legal to hunt in the dark. Before you nock an arrow it is best to check with your local laws, and chances are you won’t need the extra illumination. If you are looking for a crossbow scope that is durable and lightweight the Bolt XR from Nikon might be exactly what you need. Measuring only 8.1 inches and weighing less than one pound, you can easily mount this scope without throwing off the balance or stability of the bow. Its compact and lightweight design also make it easy to pack with the rest of your gear or carry with your bow. 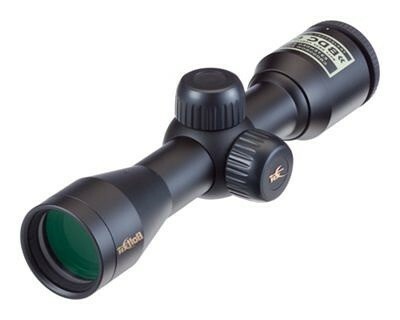 Not only is this scope lightweight, it is also incredibly durable. Once it is adjusted it will hold at zero through occasional drops, and the lens won’t easily crack. You will also appreciate the shockproof design, and the Bolt XR is water and fogproof. This allows you to easily sight distant targets in the rain or early morning without having to deal with any interference with visibility. Whenever you are looking for a new crossbow scope it is important to pay close attention to the optics. The Bolt XR comes with a high quality Nikon lens that is fully multi-coated for exceptional visibility. The coating ensures that your view won’t be affected by water or fog, while also allowing up to 92 percent of the surrounding light in. This means that images are crisp and clear, even in the dim early morning light. The ability to transmit plenty of light also ensures that the details are clearly visible. When you can see exactly where you need to aim the bow the chances of you making the shot are dramatically improved. The scope also comes with a large eyepiece for for quick viewing, and with 3 x 32 magnification there is very little you will miss when you are searching for your next target. Nikon understands that you don’t want to concentrate on the scope when you are trying to take down a large buck or bull, which is why they designed the Bolt XR to be easy to operate. The eyepiece quickly focuses so you can see prey at a glance, and with 3.4 inches of eye relief you can instantly sight a target when it wanders into your field of view. With the advantage of Nikon’s “ballistic match technology” sighting the scope is quick and easy. This also ensures that the scope is compatible with the velocity and weight of almost any crossbow and arrow so you can continue to use the gear you are familiar with. When adjustments need to be made in the field, simply dial in the range and the scope will do the rest. In seconds you will know exactly where to aim so you can make a humane killing shot. Nikon has long been a leading name in optics, and it is easy to see why with the Bolt XR crossbow scope. Capable of sighting prey farther than some bows can accurately shoot, it is a powerful scope that beginners and experienced archers can use. Pull off amazingly accurate shots at a distance and impress all of your friends during the next hunting trip. Priced relatively affordably and designed for most crossbows, you can’t go wrong with the Bolt XR from Nikon.